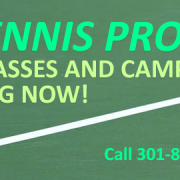 Tennis classes and camps kick off Monday! The 2017 tennis program begins in earnest Monday, June 19. Administered by the Georgetown Prep Tennis Club, the camps and classes offered to Rock Creek Pool members are designed for players of all ages and skill levels. Review the Rock Creek Pool Tennis Program for 2017.